Free Handwriting Worksheets. As a fifth grade teacher, I am really beginning to see the importance of early handwriting intervention. When I taught second and third grade I just figured that they were still learning handwriting procedures so I didn't see too much concern. However, when I see poor handwriting in the 5th grade, it becomes a much more serious problem. 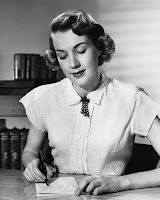 Yes, the picture above is a REAL picture of when people used to actually sit down and write a letter to another person. How much longer will our society require the need for writing? When we are at the checkout counter at the grocery store we swipe a card and push in our pin number...When we read newspapers and books, we must remember that they were all typed and revised on a computer by pressing buttons with our fingers on a keyboard...When we write a letter it is by way of email...It seems that the only people writing anymore are the students at school. Just click the links below for free dnealian handwriting worksheets and free zaner bloser handwriting worksheets. Each worksheet has upper case and lower case letters. Free Printable Zaner Bloser Handwriting Worksheets - Some people spell it Zaner-Blozer. Each handwriting font has the letter a, letter b, letter c, letter d, letter e, letter f, letter g, letter h, letter i, letter j, letter k, letter l, letter m, letter n, letter o, letter p, letter q, letter r, letter s, letter t, letter u, letter v, letter w, letter x, letter y, and letter z.